As a full-service designer and manufacturer of machinery components, Reiloy Westland Corporation offers a complete line of valves and end caps. Valves may be of a special design or from a selection of three piece free-flow, four piece, side or front discharge ball check types. 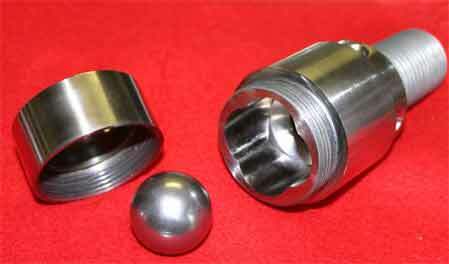 Both valves and end caps are manufactured from steels or alloys that are best suited to the processing environment in which they will be used. Various tool steels that are heat-treated and/or nitrided, nickel alloys, chrome plating and special coatings are all options from which to choose.